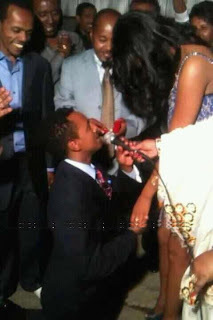 May 13, 2012 — Ethiopian pop star Teddy Afro becomes engaged with his longtime girlfriend Amleset Muchie in mid-April. 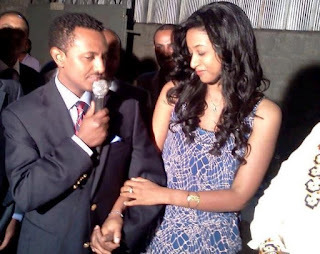 The singer proposed to the model and former beauty pageant contestant at a party attended by his family and friends in Addis Ababa. In traditional fashion, Teddy kneeled on one knee, took the microphone and asked her in Amharic if she would be his wife. She ethustastically replied with 'yes!' and embraced him with a passionate kiss. The couple have been together since late 2009, just months after Teddy was released from prison, where the 36-year-old pop singer served over two years on alleged drunk driving incident that left one homeless man dead. Ethiopian citizens first received a glimpse at how serious their relationship had grown when Teddy released his latest smash hit album, Tikur Sew (black person), which featured a song dedicated to his 25-year-old fiance.